TJ Ryan from Skibbereen, Munster Representative of Rowing Ireland photographed with Evelyn O’Sullivan of Cork Convention Bureau. Rowing Ireland hosted the Coupe de la Jeunesse, the international rowing event, at Inniscarra Lake and won the overall Sporting Event Award. It brought together 14 nations from all over Europe, over 750 athletes took part and the event delivered more than €1 million to the local economy. 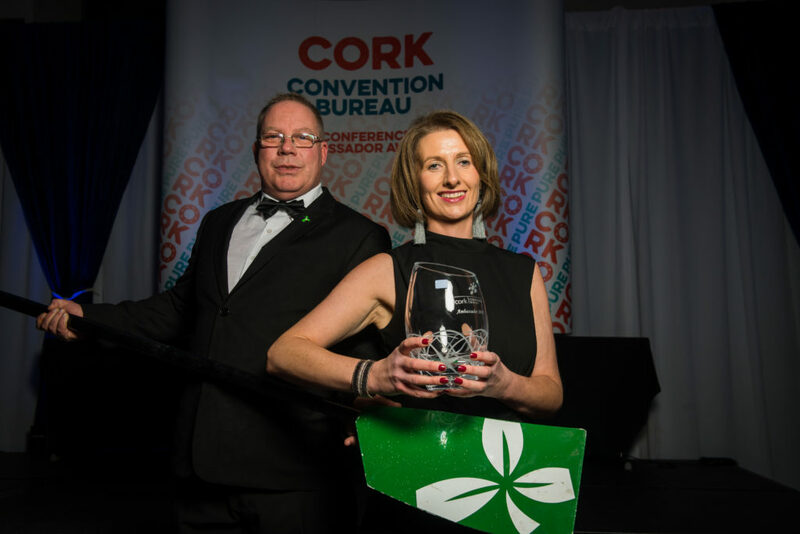 Cork Convention Bureau (CCB) hosted its annual Cork Conference Ambassadors Awards at the Radisson Blu Hotel, Little Island, Cork yesterday evening. The prestigious ceremony paid special tribute to 31 ambassadors, including four special category winning ambassadors, who have helped secure almost €11 million for the local economy over the past 12 months. The ambassadors were instrumental in bringing almost 8,000 delegates to Cork in the past year, approximately 80% of whom were international guests. “Almost €87 million has been generated in Cork as a result of business tourism and more than 75% of all business events that come to Ireland come here with the help of an ambassador. It is wonderful to be able to pay tribute to our Cork ambassadors tonight, to acknowledge their dedication to Cork and to give them the recognition they deserve.” concluded Mr Heaney. Dr. Declan Jordan from UCC, for bringing the 58th European Regional Science Association (ERSA) Congress to Cork. The conference brought over 700 academic delegates to Cork, delivering a spend of over €1 million to the local economy. Michael O’Donovan and Deirdre Hennessy from Teagasc, for bringing the 27th European Grassland Federation annual meeting to Cork. The event was worth in the region of €750,000 to the Cork region, bringing over 400 international guests to Cork. Rowing Ireland, for hosting the Coupe de la Jeunesse, the international rowing event, at Inniscarra Lake. It brought together 14 nations from all over Europe, over 750 athletes took part and the event delivered more than €1 million to the local economy. Dr. Gerard Clarke, who was instrumental in bringing the International Society for Serotonin Research conference to UCC in 2018, which was worth over €1 million to the local economy.